Roncy Rocks Sponsorship Manager position is a short-term contract for Roncy Rocks, an RVBIA event celebrating music, arts, and community to be held on Roncesvalles Avenue, June 17, 2017. The Sponsorship Manager is responsible for soliciting and securing sponsorship dollars to enable the Roncy Rocks planning team to execute a successful event. The event is budgeted at 2016 levels but has significant room to grow if additional sponsorship funds can be secured. Read more about the Roncy Rocks Sponsorship Manager position and how to apply. The RVBIA Coordinator position is a part-time contract to ensure the successful execution of Sponsored Events for the RVBIA (Roncy Rocks, Roncesvalles Polish Festival, and other) as well as the smooth running of the RVBIA, in conjunction with the Manager. This role reports to the Manager, RVBIA. Read more about the RVBIA Coordinator position and how to apply. This entry was posted in ARCHIVE, BIA Board News, Community News, Events, Our Roncesvalles, Special Events on February 12, 2017 by Veronica Feihl, Executive Director, RVBIA. At the recent OBIAA Conference held in Toronto, the founder of the Roncesvalles Village BIA, Mr. John Wakulat, was awarded the prestigious Alex Ling Lifetime Achievement Award. The Alex Ling Lifetime Achievement Award is given annually to a person in the Ontario BIA movement with major lifelong contributions to BIAs. The award is named after Alex Ling, one of the founders of the world’s first BIA, the Bloor West Village BIA, in 1970. Today there are 83 BIAs in Toronto, hundreds across Canada, and thousands upon thousands around the world. John got his start in Roncesvalles Village in the 1950s when he started work at Pollocks Hardware Store. He bought the store in 1976 and it rapidly became one of the top stores in the Home Hardware chain. In 1986 John was instrumental in founding the Roncesvalles Village BIA, a merger of two smaller BIAs on Roncesvalles Avenue. He served as chair of the Roncesvalles Village BAI for many years and still sits on the board as Chair Emeritus. John has also served as president of TABIA, the Toronto Association of BIAs from 2002 until 2010, returning to the role in 2012. We congratulate John for this richly deserved award! This entry was posted in BIA Board News, CURRENT, Front Page, Kudos! on April 28, 2015 by Keith. The Roncesvalles Village BIA was honoured to receive a declaration from the City of Toronto at this week’s TABIA Awards Night, held at the beautiful Palais Royale. The Roncesvalles Village BIA was founded in 1986. Its first chair (now chair emeritus) was John Wakulat, and expanded in 2007 to include all of Roncesvalles Avenue. Through its twenty-eight year history, the BIA has reached many milestones, including one of the City’s first BIA graffiti removal programs, innovative streetscape designs, and successful promotional events, most notably the Roncesvalles Polish Festival, now acknowledged as the largest celebration of Polish culture anywhere outside of Poland. This entry was posted in BIA Board News, CURRENT, Front Page, Kudos! on December 4, 2014 by Keith. Thank You Tony, and Welcome John! At the 2013 Annual General Meeting of the Roncesvalles Village BIA, Tony Cauch announced his retirement from the position of Chair of the BIA. Serving as the Chair of the BIA for some fourteen years, Tony lead the BIA through some of the most significant events of its history, including the founding of the Roncesvalles Polish Festival in 2005 and Roncy Rocks! 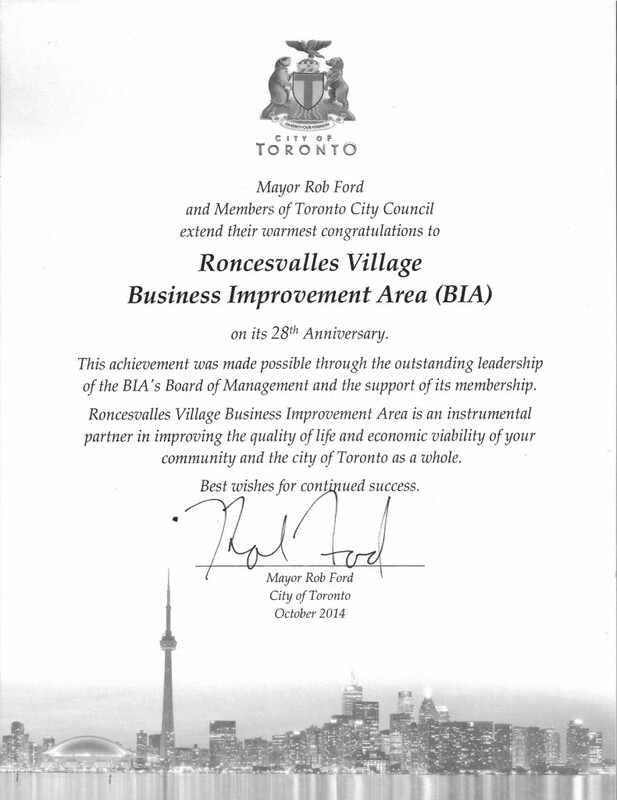 in 2010, the expansion of the BIA to include all of Roncesvalles Avenue in 2007, and guided our organization through the unprecedented upheaval of construction from 2009 to 2012. Tony will continue to serve on the board of the BIA as Chair Emeritus, joining Founding Chair John Wakulat and long-time Vice-Chair Andrew Chomentowski. The board of the Roncesvalles Village BIA looks forward to his continued guidance and wishes him the best for his future endeavours. John Bowker, owner of She Said Boom!, was appointed Chair of the Roncesvalles Village BIA at the Annual General Meeting. John has served on the board of the BIA for many years as Chair of the Beautification Committee and since 2012 as Vice-Chair. In this role he oversaw the creation of a number of murals on Roncesvalles Avenue, including the popular, cost-effective and innovative Top to Bottom Mural Project. John also represented the Roncesvalles Village BIA in the community group Roncesvalles Renewed, which provided significant input to the City of Toronto in designing the new streetscape of Roncesvalles Avenue, including the dozens of new trees and the many planter beds that now beautify our street. Throughout this process, John fostered strong relationships between the Roncesvalles Village BIA and numerous local community groups, including the Roncesvalles-MacDonell Residents’ Association, the Sunnyside Community Association and the High Park Residents’ Association, as well as dozens of community volunteers who gave of their time and expertise to the benefit of our neighbourhood’s high street, Roncesvalles Avenue. John was also a driving force behind the Dundas Roncesvalles Peace Garden, which is expected to be constructed in late 2014 and will be a significant gateway feature for the north end of Roncesvalles Avenue. Len McAuley, owner of Pollocks Home Hardware, served as chair of the Business Continuity Committee through the construction, and as chair of the Properties and Maintenance Committee, has been appointed vice-chair of the board of directors of the Roncesvalles Village BIA. This entry was posted in BIA Board News, CURRENT, Front Page on January 13, 2014 by Keith. On November 16 there was a brief ceremony at City Hall to thank the hard-working volunteers of City of Toronto agencies, boards and commissions. Many hundreds of people volunteer their free time to serve on various boards, including those that govern the 72 BIAs in Toronto. 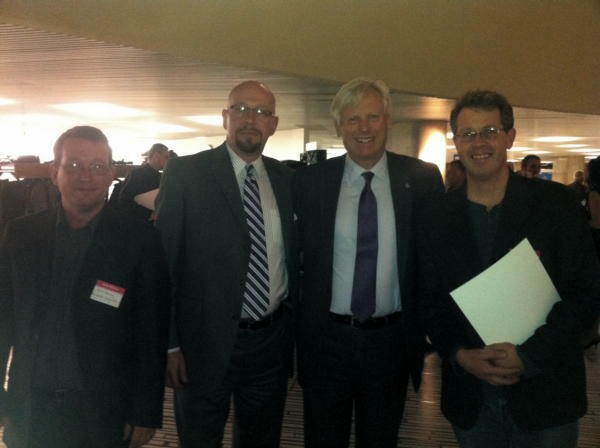 Representing the Roncesvalles Village BIA in the photo at left, RVBIA Coordinator Keith Denning, RVBIA Chair Tony Cauch, Mayor David Miller, and RVBIA Chair of Beautification Committee John Bowker. This entry was posted in BIA Board News, CURRENT, Front Page, Kudos! 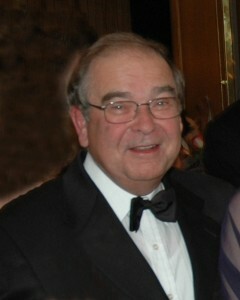 on November 17, 2010 by Keith Denning, Coordinator, RVBIA.